There has been a break in my Friday Fixation Posts - but I'm back this week with a good one. Considering that 2 of my 30 before 30 items are photography related - its probably not a suprise that I am in love with the accessories at the Photojojo Store! I don't think there is one item in the store that I don't want. But in efforts to keep this post short and sweet - I'll only tell you about a few. First - the SLR Bokeh Kit. For $25 - the effects this kit creates are awesome. This will be one of my first purchases from Photojojo I'm sure. I really have been enjoying my 8-point star filter and these seem just as cool. Of course I also feel as though I NEEED an Instax camera. 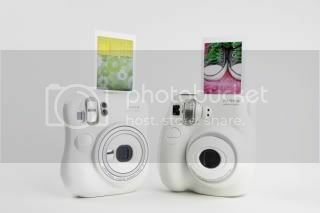 I love the instant pics - and these mini's are adorable. A little bit on the pricy side (at least for the film) but I'd guess well worth it. I wish I could find my old Polaroid... that would fill my instant camera void as well. Although film can be an issue. The last item in the store I'm going to share (but be sure to check out the whole store) is the photo paddles. I would already own the mustache and the lips if they weren't out of stock. $10 each -- and I LOVE the clear paddle that makes these slightly better then the rest I've seen. Anyways - maybe you can see why I spend so much time on this site. They also do great "how to" stuff like "How to Create Coloring Book Pages Using Your Photos" Something I think would be fun to do! Explore .... have fun ... and happy Friday! !